The Seleucid empire fell apart as things do – internal failures and others’ successes, inevitability and chance. The epithets of kinglets accumulated, reechoing because the core was hollow… When at last the lots were shaken and the world divided, the kingdom’s west fell to Rome and its east to Parthia (Kosmin, 256). Antiochos Epiphanes, 128 BC. AR Tetradrachm (29mm, 16.68 g, 12h). Antioch mint. Diademed head right / Tyche standing left, holding scepter and cornucopia; Σ to outer left, N in circle to inner right. Houghton & Le Rider 2 (D1/R1); SC 2208; HGC 9, 1145. In 128 BCE, Syria rose in revolt against the hated regime of Demetrius II (see Part III, above). His wife, Cleopatra Thea, put a young son on the throne, seeking popular favor. 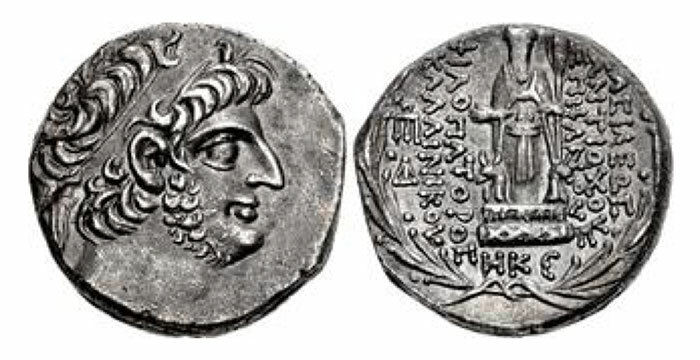 The identity of the child and his fate are disputed; Seleucid royals were often named “Antiochus”, and even his epithet on the coinage, Epiphanes (“illustrious”), was frequently recycled. Rare tetradrachms of this brief reign show “a very pretty child, with chubby cheeks, double chin, and a slight smile (Houghton, 436).” A standing figure of Tyche, Antioch’s patron goddess, appears on the reverse. Alexander II Zabinas (128-122 BC). AR tetradrachm (28mm, 16.75 gm, 12h). Antioch. Diademed head right / BAΣIΛEΩΣ AΛEΞANΔPOV , Zeus seated left, holding Nike and scepter; monogram to outer left, Σ below throne. SC 2219.5b. HGC 9, 1149d. Ex Triton V (15 January 2002, lot 1505; John W. Garrett Collection, Part II (Numismatic Fine Arts/Bank Leu, 16-18 October 1984), lot 300; Petrowicz Collection (Naville X, 15 June 1925), lot 1368. Born about 150 BCE, Alexander II Zabinas was the son of a Greek Egyptian merchant. The Egyptian ruler Ptolemy VIII, turning against his niece Cleopatra Thea, sponsored 22-year-old Alexander as claimant to the Seleucid throne, promoting fake news that he was an adopted son of the dead Antiochus VII Sidetes. Another ancient writer, Eusebius, claimed that Zabinas said he was the son of Alexander I Balas, an earlier ruler whose private lineage was murky, but who publicly purported to be the son of Antiochus IV. His Aramaic nickname “Zabinas” means “the purchased one”. Alexander Zabinas was a jovial easy-going youth, the sort of king sure to be popular in the streets of Antioch. 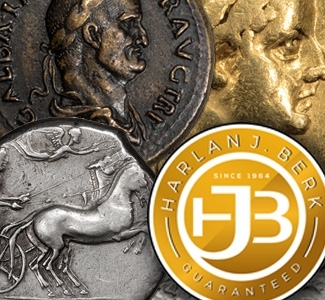 There is a kind of happy … impudence in the face which appears on his coins (Bevan, 251). Funded by Ptolemy, a mercenary army enabled Alexander to defeat Demetrius II and gain control of Antioch in 128 BCE. On his coins, he is simply “King Alexander”. A seated figure of Zeus Nikephoros (“Zeus Bearer of Victory”) adorns the reverse. This idol of the Olympian god was Alexander’s downfall. Short of cash in 122, he melted down the golden statuette of Nike (the goddess of Victory) held in the god’s outstretched hand. He joked that Zeus “gave him Victory.” The people of Antioch, failing to get the joke, drove him out. Captured by troops of Cleopatra Thea and her son, Antiochus VIII, he was executed. 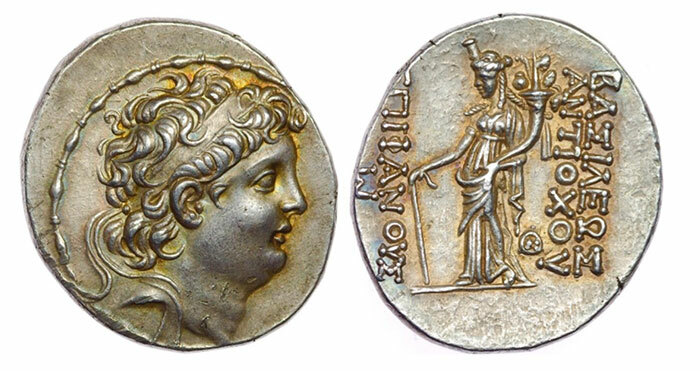 Cleopatra Thea Eueteria AR Tetradrachm. Sole reign. Ake-Ptolemais, dated SE 126/125 BC. Diademed and veiled bust of Cleopatra Thea right, wearing stephane / BAΣIΛIΣΣHΣ KΛEOΠATΡAΣ ΘEAΣ EΥETHPIAΣ, double-cornucopiae tied with fillet, monogram to right, [date IΠP (= year 187) in exergue]. SC 2258.2; BMC 1 = LSM, NNM 84, 7; Houghton, CSE 803; Seyrig, Tresors II, 30.242; Spink 3014, 87 (same obverse die). 16.74g, 30mm. Cleopatra Thea was the daughter of Ptolemy VI and his sister-wife, Cleopatra II. Her political marriages to three successive Seleucid kings were a triumph of Ptolemaic diplomacy. In 125 BCE, after the death of Demetrius II she took the throne as sole ruler. 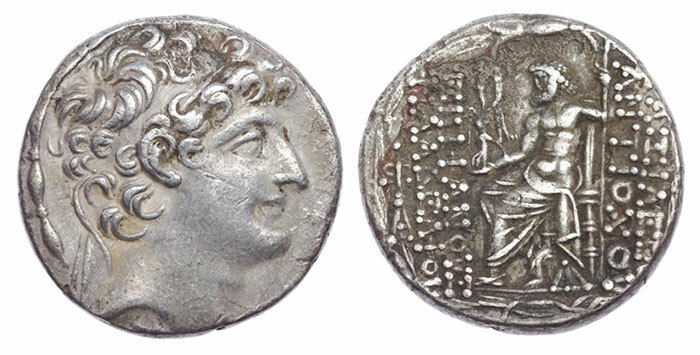 From her base at Ake-Ptolemais (now Akko, Israel) she issued rare portrait tetradrachms, wearing the tight curls (probably a wig) associated with the goddess Isis. The Ptolemaic double cornucopia appears on the reverse, with the inscription BAΣIΛIΣΣHΣ KΛEOΠATΡAΣ ΘEAΣ EΥETHPIAΣ (“Queen Kleopatra, Goddess, Bringer of Good Harvests”). In a recent London auction, an example of this coin – one of just five known – brought over $40,000 USD. Cleopatra Thea and Antiochus VIII (125-121 BC). AR tetradrachm (29mm, 16.59 gm, 12h). Akko-Ptolemais mint, undated. Jugate busts of Cleopatra, with stephane and veil, and of Antiochus, diademed, right; all within bead-and-reel border / ΒΑΣΙΛΙΣΣΗΣ ΚΛΕΟΠΑΤΡΑΣ ΘΕΑΣ – ΚΑΙ ΒΑΣ-ΙΛΕΩΣ ΑΝΤΙΟΧΟΥ, Zeus, seated left on throne, holding scepter with his left hand, holding Nike on extended right hand. SC II, 2271.1. The idea of a queen ruing directly over the kingdom troubled Seleucid elites, and they forced her to accept her son, Antiochus VIII, as co-ruler. Known by the nickname Grypos (“hook nose”), his official epithet Epiphanes (“Illustrious”) appears on the coinage. 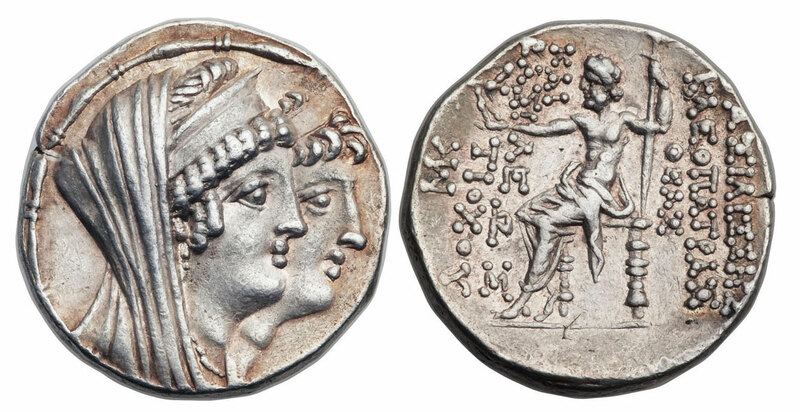 For four uneasy years (125-121 BCE) mother and son appeared together on tetradrachms struck at Tarsus and various mints in Phoenicia and Syria. [Kleopatra] was discontented at her dignity being eclipsed by the victory of Grypus, and presented him with a cup of poison as he was returning home from taking exercise. But Grypus… desired her …to drink herself first, and, when she refused, pressed her earnestly… The queen, being thus disconcerted, and her wickedness turned upon herself, was killed with the poison which she had prepared for another. Antiochos VIII Epiphanes (Grypos). 121/0-97/6 BC. AR Tetradrachm (30.5mm, 16.59 g, 12h). Ptolemaïs (Ake) mint. 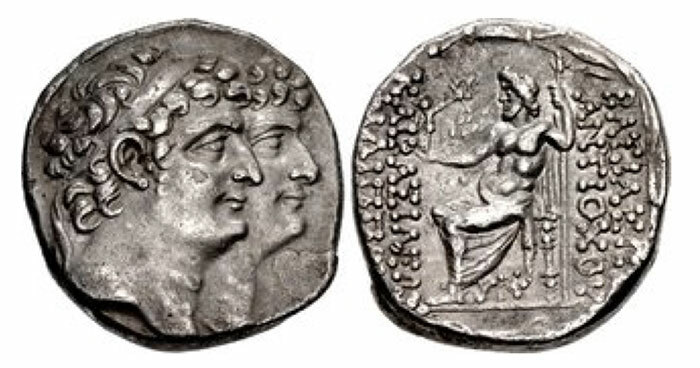 Struck circa 121/0-113 BC. Diademed head right / Zeus Ouranios standing left; monogram to outer left; all within wreath. SC 2336.2a; HGC 9, 1197h. Good VF. Antiochus VIII and his prominent nose appear on an extensive and abundant coinage from over a dozen mints during a reign of nearly 30 years. On many types, the reverse is a slim standing figure of Zeus Ouranios (king of the gods, as ruler of the sky) with a crescent moon above his head and a star in his outstretched hand. Coins issued at Tarsus in Cilicia bear an image of the altar of Sandan, a local divinity the Greeks equated with Herakles. Grypus married an Egyptian princess, Tryphaena (c. 141 – 111 BCE), daughter of Ptolemy VIII. She bore Antiochus five sons, each of whom would rule as a Seleucid king: Seleucus VI, Antiochus XI, Philip I, Demetrius III, and Antiochus XII. In 102, Grypus married the Egyptian princess Cleopatra Selene. Six years later in 96 BCE, Heracleon, the prime minister, murdered Antiochus VIII in a palace coup. Antiochos VIII Epiphanes (Grypos). 121/0-97/6 BC. AR Tetradrachm (29mm, 16.43 g, 12h). Tarsos mint. 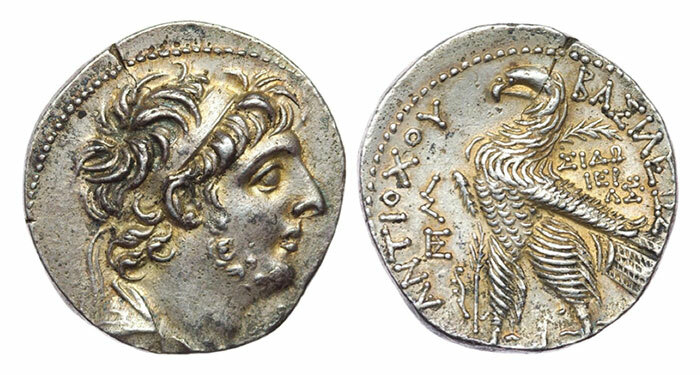 First reign at Tarsos, series 2, struck 121/0-114/3 BC. Diademed head right within fillet border / [BA]ΣIΛEΩΣ ANTIOXOY EΠIΦANOYΣ, Sandan standing right on back of horned and winged lion standing right upon garlanded altar with baldachin; two monograms to outer left. 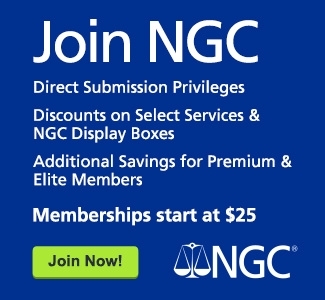 SC 2286a; HGC 9, 1198; BMC 22. Antiochus IX, nicknamed “Cyzicenus”, grew up in the safety of Cyzicus (near modern Erdek, Turkey), far from the Seleucid court’s murderous intrigues. His official epithet was Philopator (“Father-Loving”), honoring his father Antiochus VII Sidetes. In 116 BCE he claimed the throne, beginning a long civil war against his half-brother Antiochus VIII Grypus. 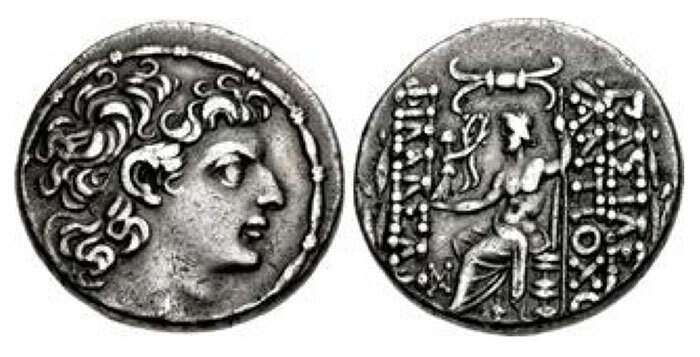 Antiochus IX Cyzicenus, mint of Sidon, Diademed and draped bust of Antiochus IX with long curly sideburns, thin beard, dotted border. Rv. Eagle standing, palm branch Year 200 = 113/2 BCE. SC 2386. His coin portrait shows long sideburns, which sometimes merge into a scruffy beard. In 95 BCE, Antiochus IX Cyzicenus died in battle against his nephew, Seleucus VI. Seleukos VI Epiphanes Nikator. Circa 96-94 BC. AR Tetradrachm (28mm, 16.35 g, 12h). Seleukeia on the Kalykadnos mint. Diademed head right within fillet border / Athena Nikephoros standing left; flower to outer left, PHIAN to inner left. SC 2405, HGC 9, 1265. Eldest son of Antiochus VIII Grypus, Seleucus VI had to fight his uncle, Antiochus IX, to claim the throne. Then he had to fight his cousin, Antiochus X (son of Antiochus IX), to briefly hold it. 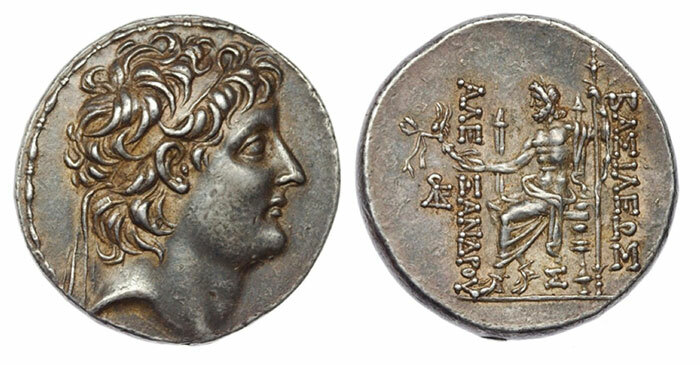 An elegant standing figure of Athena graces the reverse of his tetradrachm from Seleukia in Cilicia. Ancient sources describe him as tyrannical and violent. When he tried to extort funds from the citizens of Mopsuestia (or Mopsus, near modern Adana, Turkey), they revolted and burned him to death. His twin brothers, Antiochus XI and Philip I, avenged him by sacking the town. Demetrios III Eukairos. 97/6-88/7 BC. AR Tetradrachm (27mm, 16.22 g, 12h). Damaskos mint. Dated SE 218 (95/4 BC). Diademed head right / Cult statue of Atargatis standing facing, arms extended, holding flower in left hand, barley stalk rising from each shoulder; N above monogram to outer left, HIε (date) and monogram in exergue; all within wreath. SC 2450.7. The fourth son of the prolific Antiochus VIII, Demetrius III took control of Damascus in 96 BCE. His tetradrachms bear the image of Atargatis, a Syrian fertility goddess. 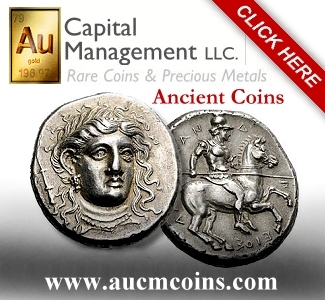 He inscribed his epithets ΘΕΟV ΦIΛOΠΛTOPOC CΩΤΗΡΟC (“Father-Loving God and Savior”) on his coins, but his nickname Eucaerus (or Eukairos, “in good time, timely”) is apparently a manuscript copyist’s misreading of Jewish historian Josephus, who called him Acaerus (“untimely”). Demetrius fought against the Judaean ruler Alexander Jannaeus, against his brother Philip, and against the Parthians, who captured him in 87 BCE. Demetrius III died an honored prisoner, in exile. Antiochus X Eusebes Philopator. Circa 94-88 BC. AR Tetradrachm (28mm, 15.57 g, 12h). Antioch mint. Struck 94 BC. Diademed head right / Zeus Nikephoros seated left; monograms to outer left and below throne; laurel wreath border. SC 2429.1; HGC 9, 1288. Born about 113 BCE, Antiochus X took the epithets Philopator (“Father-Loving”) and Eusebes (“Pious”), which appear on his reduced-weight tetradrachms. Antiochus X’s youthful, wide-eyed portrait is distinctive, lacking the family’s prominent hooked nose. He ruled a disintegrating kingdom from 95 to 88 BCE, fighting continuously against his cousins, the sons of Antiochus VIII. He married Cleopatra Selene, widow of both his uncle and his father. Antiochus X died in battle against the Parthians but sources are contradictory and the date is uncertain. Tigranes II, the Great. 95-56 BC. AR Tetradrachm (35mm, 16.24 g, 12h). Tigranocerta mint. Draped bust right, wearing tiara with star and eagles; pyramidal points on tiara / BASILEWS TIGRANOU, Tyche of Antioch seated right on rock, holding branch; below, river-god Orontes swimming right; to inner left, star/D/M; H to inner right. Nercessian Group 11 (A69/P8); CAA 29 var. (no star; same obv. die as plate coin); AC 36 (same obv. die as plate coin). By 83 BC the people of Syria had become so utterly fed up with the interminable fratricidal wars of the Seleucid line that, in desperation they sought the protection of Tigranes of Armenia, and joyfully hailed him as their king (Newell, 65). Tigranes II “the Great” was eventually (69 BCE) driven out of Syria by the Roman general Lucius Lucullus, and the Seleucids returned. Under Armenian rule, silver tetradrachms depict Antioch’s emblematic statue of Tyche and the river god Orontes. Antiochos XI & Philip I. Circa 94-93 BC. AR Tetradrachm (26mm, 15.75 g, 1h). Uncertain mint in Cilicia. Diademed jugate busts right / BAΣIΛEΩ[Σ] ANTIOXOY KAI BAΣIΛEΩΣ ΦIΛIΠΠΟV, Zeus Nikephoros seated left; Φ below throne. SC 2438 (same dies as illustration); HGC 9, 1297 (same dies as illustration); Triton II, lot 484 = Freeman & Sear FPL 5, no. E83 (same dies). Near EF. Extremely rare, one of two known for this issue. Younger sons of Antiochus VIII Grypus, Antiochus XI and Philip were probably fraternal twins; they shared the epithet Philadelphus (“Brother-loving”). 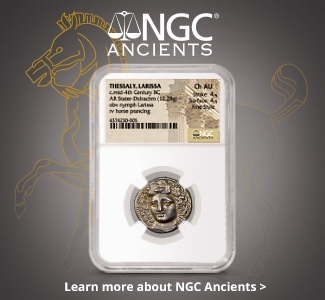 The two appear together on rare coins of their brief joint reign (94-93 BCE), of which only about eight are known; one example brought $22,500 in a recent auction. Rare tetradrachms of Antiochus alone were struck at Antioch; only 11 examples known. Antiochus XI drowned in the river Orontes while fleeing the defeat of his army by his cousin, Antiochus X.
Antiochos XI Epiphanes Philadelphos. Circa 94/3 BC. AR Tetradrachm (27mm, 15.48 g, 12h). Antioch on the Orontes mint. Diademed head right within fillet border / BAΣIΛEΩΣ ANTIOXOV EΠIΦANOVΣ ΦIΛAΔEΛΦOV, Zeus Nikephoros seated left; to outer left, monogram above A; monogram below throne; all within laurel wreath. SC 2441; HGC 9, 1299. After 88/7, when Philip took possession of Antioch it became his principal mint, issuing a prodigious number of tetradrachms… Philip’s Antiochene tetradrachms became the standard currency of Syria (Houghton, 596). 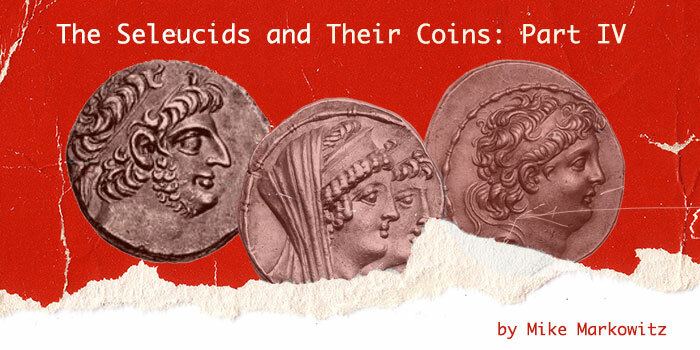 Struck to a reduced weight standard of about 15.65 grams, these coins proved so popular that they remained in production and circulation under Roman rule for decades after Philip died (in either 83 or 75 BCE; as usual, sources are contradictory). Nice examples can be found for under $200. Antiochos XII Dionysos. 87/6-83/2 BC. AR Tetradrachm (25mm, 15.77 g, 1h). Damaskos mint. Dated SE 228 (85/4 BC). Diademed head right, with short beard / [B]ΛCIΛEΩC ΛNTIOXOV EΠIΦΛNOVC ΦIΛOΠΛTOPOC KΛΛΛINIKOV, Cult image of Hadad, holding grain ear in right hand, standing facing on double basis; two bull foreparts flanking legs; two monograms to outer left, HKε (date) in exergue. SC 2472.1 corr. (lower monogram); HHV 9 corr. (same, and unlisted dies); HGC 9, 1324; DCA 309. Good VF, Extremely rare. Youngest son of Antiochus VIII, Antiochus XII took the nickname Dionysus, but on coins his epithets are Epiphanes Philipatoros Callinicus (“Illustrious, Father-Loving, of Noble Victory”). He took power at Damascus in 87 BCE after the Parthians captured his brother, Demetrius III. To please his subjects, he placed the local storm god Hadad on the reverse of his tetradrachm. For the last two years of his reign (c. 87-83) his portrait is bearded. Antiochus XII died fighting the Nabateans in 83. Antiochos XIII Philadelphos (Asiatikos). 69/8-67 & 65/4 BC. AR Tetradrachm (26.5mm, 14.79 g, 12h). Antioch on the Orontes mint. Diademed head right within fillet border / BAΣIΛE[ΩΣ] ANTIOXO[V] ΦΙΛΑΔΕΛΦ[ΟV], Zeus Nikephoros seated left; MA monogram to inner left; all within laurel wreath. SC 2487a; SMA 460; HGC 9, 1340. VF, toned, some porosity, slightly off center. Very rare, only two in CoinArchives. On the few coins that survive of Antiochus XIII we behold the portrait of a somewhat fatuous young man, though endowed with the large Seleucid nose, this feature seems unable to redeem the utterly vacuous expression possessed by this last feeble descendant of a very long and picturesque line of kings (Newell, 65). A son of Antiochus X and Cleopatra Selene, the last Seleucid king was nicknamed “Asiaticus” because he grew up in the Roman province of Asia (now the western third of Turkey). His mother was captured and executed by Tigranes. When the Romans drove out Tigranes in 69 BCE, Asiaticus was installed as a puppet at Antioch, where he issued a few rare, crudely executed tetradrachms. One example brought $4,250 USD in a recent auction. In 64 BCE, the Roman general Pompey the Great (Gnaeus Pompeius, 106 – 48 BCE) deposed Antiochus XIII and made Syria a Roman province. The king’s fate is unknown. The author is grateful to Dr. Bradley Bowlin, Peter K. Tompa, and Mary Lannin for help in researching this complex and fascinating coinage. 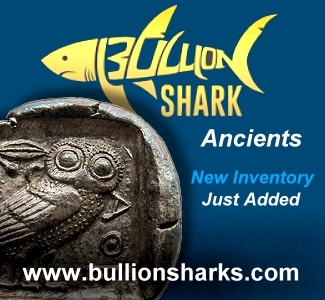 Photos and coins provided by The Medicus Collection, all rights reserved. The famous Cleopatra (69 -30 BCE), last Ptolemaic ruler of Egypt, was number VII. Roma Numismatics Auction XIII, 23 March 2017, Lot 448. Realized £32,000 (approx. $41,893 USD as of 4/2/2019) against an estimate of £12,500 (approx. $16,365 USD). Heritage NYINC Sale, 4 January 2015, lot 30089. Realized $2,200 USD. CNG Electronic Auction 438, 20 February 2019, Lot 219. Realized $300 USD. Known as “Cleopatra Selene of Syria” to avoid confusion with the daughter of Cleopatra VII and Mark Antony. Gemini Auction I, 11 January 2005, Lot 219. Realized $520 USD. CNG Triton XXII, 9 January 2019, Lot 341. Gemini Auction XI, 12 January 2014, Lot 287. Realized $350 USD. CNG Auction 109, 12 September 2018, Lot 349. Realized $16,000 USD. CNG Auction 109, 12 September 2018, Lot 350. Next articleMichigan Coin Dealer To Reward First Five People Who Find A Rare “W” Mintmarked Quarter In Circulation!